FOSSILS - What are Fossils? Fossils are preserved remnants of past living organisms. They can found all over our planet and in places that one would never expect, such as marine life fossils in the driest deserts on top of the highest mountains. For example, Antarctica has a rich marine life fossil deposit buried under its present-day frozen crust. Our planet Earth is over 4.5 billion years old and throughout that time, many changes have taken place. The fossils left behind help to tell us of these past events that changed our planet. Think of fossils as a "written record' of Earth's past. Fossils are always dated to a specific time in the past, or what is called a 'Geologic Period'. We can look at the history of life through the record of fossils and how it relates to the Geologic Time Scale (shown below). While radiometric dating puts the Earth at an age of roughly 4.5 billion years, the first evidence of life on the planet in the form of fossils dates back to the Pre-Cambrian Period. During the Cambrian Period, we have literally the first explosion of life that baffles science to this day. Appropriately so, this event is called the "Cambrian Explosion" and many diverse forms of life "suddenly" appear in the fossil record with no former evolutionary predecessors. After this time, we have a series of mass extinctions and return of life-forms over the course of Earth's history up until the Pleistocene Period, dated 10,000 years ago. The end of the Pleistocene marks our planet's last mass extinction. It is this event that results in the total extinction of major groups of planet-wide life such as ammonites and dinosaurs, as well as other creatures such as large marine reptiles and flying reptiles, and many types of megafauna such as the woolly mammoth and woolly rhinoceros, to name a few. Organisms are only rarely preserved as fossils in the best of circumstances, and only a fraction of such fossils have been discovered. This is illustrated by the fact that the number of species known through the fossil record is less than 5% of the number of known living species, suggesting that the number of species known through fossils must be far less than 1% of all the species that have ever lived. Because of the specialized and rare circumstances required for a biological structure to fossilize, only a small percentage of life-forms can be expected to be represented in discoveries, and each discovery represents only a snapshot of the process of evolution. The transition itself can only be illustrated and corroborated by transitional fossils, which will never demonstrate an exact half-way point. The fossil record is strongly biased toward organisms with hard-parts, leaving most groups of soft-bodied organisms with little to no role. It is replete with the mollusks, the vertebrates, the echinoderms, the brachiopods and some groups of arthropods. From the earliest Cambrian Period to the latest Pleistocene Period, we can observe numerous minor and several mass extinctions thanks to the fossils they left behind. When we use the term "fossils" we refer to preserved specimens of former life that must be no younger than the Pleistocene Period or not less than 10,000 years old. Anything after this time is not really considered a fossil per se, and relates to our current geologic epoch known as the Holocene Period. Geochronology is different in application from biostratigraphy, which is the science of assigning sedimentary rocks to a known geological period via describing, cataloging and comparing fossil floral and faunal assemblages. Biostratigraphy does not directly provide an absolute age determination of a rock, but merely places it within an interval of time at which that fossil assemblage is known to have coexisted. Both disciplines work together hand in hand, however, to the point where they share the same system of naming rock layers and the time spans utilized to classify layers within a stratum. Geochronology is the science of determining the age of rocks, fossils, and sediments using signatures inherent in the rocks themselves. Absolute geochronology can be accomplished through radioactive isotopes, whereas relative geochronology is provided by tools such as palaeomagnetism and stable isotope ratios. By combining multiple geochronological (and biostratigraphic) indicators the precision of the recovered age can be improved. Fossils are formed in several different ways but most involve a dead organism being replaced, to a varying degree, by minerals carried in water. In general, most fossilization events are due to the organism becoming buried and then mineralized. This water can be water percolating down into the ground to act upon the buried organism, or it can be upon a dead organism buried and submerged in water. In some cases, the organism completely disintegrates and leaves a cavity that becomes the mold for minerals to form and take the exact shape. In other cases, the organism is anatomically preserved and may appear as when formerly alive. In rarer instances, the actual organism retains its original substance such as some cave fossils of mammals whereby the bone is still in the same form as if it were only 100 years old. Insects that have been trapped in amber is also another example of a total lifelike preservation of the original organism. PERMINERALIZATION - Minerals are deposited in the cells of the organism which crystallize the cell walls and create a very lifelike fossil that can even retain internal structures as they were when alive. Fossils of this type can also contain some of the original material from the organism such as a shell. An example of fossils created by permineralization would be ammonites with original outer shell substance and all internal chambers intact. Dinosaur bones with open internal cell structure intact are also another example of this kind of fossil. Permineralization can fossilize an organism to a widely varying degree of preservation. PETRIFICATION - This is a process that advances after permineralization whereby the silicified cell walls of the organism then progress to becoming completely filled with minerals. An example of this would be petrified wood where a sliced portion shows internal structures but is pure stone with no open, hollow structures. Another example is dinosaur bone that can be sliced and polished in cross-section and be solid but may still display remnants of the walls of the former internal bone cell anatomy. MOLD and/or CAST - In a mold, the former organism is completely dissolved and all that is left is a life-like negative cavity creating a mold. A cast is taking it one step further whereby, after the mold is formed, the cavity is slowly filled with minerals and an exact copy in stone is formed of the former organism. An example of a MOLD fossil would be the many bivalve fossils that can be found inside some rocks. 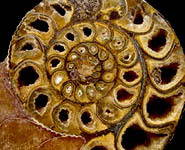 An example of a CAST fossil would be ammonites that have no former shell and no internal structure such as the Cretaceous ammonites found in Texas, U.S.A.. INTACT ORIGINAL - Fossils of this type are the actual former living object still intact in original organic form. This is very rare but most often the case with fossils found in caves. Some caves are literally like a time capsule with no environmental disturbance. Here you can have a fossil mammal bone sitting up on a rock out of the way of standing water and 40,000 years later, the bone can still be burned like wood and is still in its original organic form. Some other forms of INTACT ORIGINAL fossils are teeth which being comprised of dense stable materials like dentin and enamel, resist mineralization. Scientists have been able to extract collagen from fossil teeth because the preservation is in essence, still in its original substance as it was when the organism was still alive. PSEUDOFOSSIL - A geological anomaly that resembles a former living organism but is purely coincidental and has no origin in being a trace or remain of a living organism. Pseudofossils have been fooling people for millennia. Most often, they are odd-shaped nodules or concretions. Some can look amazingly authentic but of an organism that would be impossible to preserve in the manner in which it is found, such as a petrified human head. Other forms of pseudofossils can be an odd-shaped pattern in stone such as mineral dendrites on lithographic limestone rock that resemble plant fossils.